Some time ago we shared our research on Gi2MO Types – a taxonomy that allows to classify ideas based on a number of their characteristics. We also showed a sneak peak of how this could be used in practice. Today, we would like to go above and beyond that preview and deliver an actual solution that builds on top of our taxonomy – Gi2MO Metrics. The principal notion behind Gi2MO metrics is to automatically generate a number of indicators that would allow to determine performance of idea contests, selected idea datasets or entire Idea Management Systems. 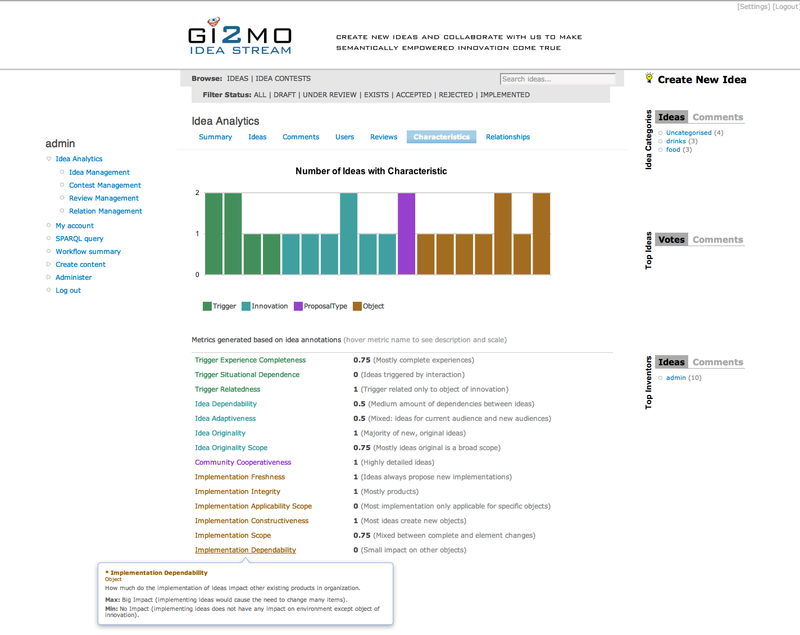 The metrics are created based on the Gi2MO Types annotations (see here how to apply annotions in IdeaStream) – we propose one metric per each Gi2MO Types taxonomy sub-tree. Apart of a theoretical solution, today we are also happy to deliver its implementation – Gi2MO Metrics support included in our IdeaStream Analytics module. The module is a supplementary component that calculates various statistics and gives access to data management panels for our open-source Idea Management System: Gi2MO IdeaStream. 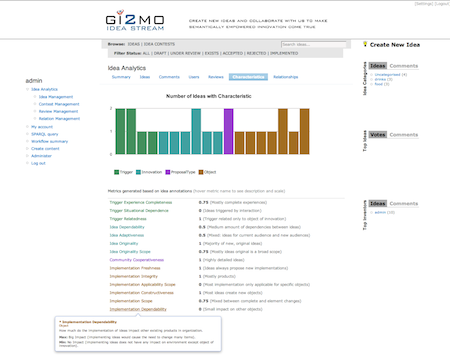 The support for Gi2MO Metrics is enabled automatically if you already installed Gi2MO Types taxonomy. Gi2MO Metrics calculated by IdeaStream Analytics. Before trying out the updated Analytics module, we recommend to check the detailed description of all metrics in a new subpage of Modelling section. If you wish to test how the metrics perform with your own data head over to the apps section and download the new release of IdeaStream Analytics module. Apart of the Gi2MO Metrics on board, you may find out that the new IdeaStream Analytics version comes with a number of other updates: relationship management and statistics (for recently released IdeaStream Similarity module), CSV export for all available statistics and data management views.